Can you use YouTube.com to find out where a video was uploaded? I’m not saying you can. I’m not saying you can’t. But I think it is interesting to try. Using the following method YouTube has led me to the homes of a few people I know. Does it work for you?? Start with YouTubes “Advanced Search”. Click “Advanced Options” and “Show Map”. Type in the userid of the person your trying to location and click the SEARCH box inside the advanced search box (not the one at the top). If the video is in the circle it will be displayed in the result. 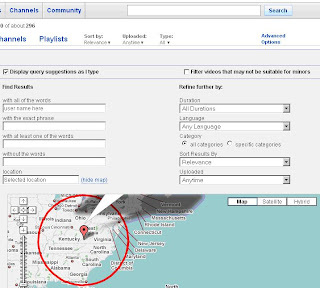 If not you will see “No Videos found for xyz” and a playlist for the user you are searching for. The difference between a hit/no hit is subtle. Do a search for something you know is geoencoded so you can see the differenece. As a rule, if you see this then the video is not in the circle. Zoom in one click at a time making your circle smaller and smaller to see if the video is still in the circle. If search results disappears, its no longer in the circle. Using this method you could take the search down to a city block or so. Then you can switch to http://maps.google.com/ and enable the YouTube overlay. You may find the video is places directly on top of the house where it was uploaded. But a video overlay only appeared in 1 out of the 6 times that I tried to narrow down to a street. It looks like the youtube overlays of Google maps doesn't have as much data as the map search on youtube. I tested it with 3 video’s where I knew the target street address and in all 3 cases was able to locate their street. In one of the three cases the Google maps overlay displayed the YouTube video on top of the correct house. In one other case I narrowed down a video to a street, but when I asked the account owner about the address he had no idea how that address related to his video although it was within a few miles of his house. There were several cases where I couldn’t get YouTube to return any Geo-encoded video’s on that users account. Its not science, but here is some interesting data being revealed by that search. UPDATE 1-31: It appears that in the test case where the video led me to a strange location several miles from the account owners home, the video may have been tagged to the geographic center of the zip code of the uploader. This is going to be a significant stumbling block for any open source youtube geotagging missile guidances system projects resulting from this ground breaking research.